If you’ve shied away from smiling due to crooked teeth, we are delighted to announce that we offer Invisalign at Vital Dental Care. While traditional metal braces get the job done when it comes to aligning teeth, many people today prefer a more discreet way to get a straighter smile. Invisalign is supported by 20 years of clinical research and has over 700 patents. With millions around the globe who wear the aligners, you can be confident knowing you’ve chosen an excellent product. Clear in appearance: The aligners are practically invisible so you can straighten your teeth without the whole world knowing. Comfortable: You won’t have to experience metal wires poking your cheek with Invisalign aligners, which are comfortable and better-fitting than traditional braces. They are easy to put on and remove. Fast: With Invisalign you can achieve a straighter smile faster than with traditional braces —usually in about 12-14 months. Convenient: Because the aligners are removable, you aren’t restricted about what you can eat. So whether you enjoy crunchy carrots or crave popcorn, you can eat those and other foods without worrying about breaking a bracket. You also can brush and floss your teeth easily. Did you know that properly aligned teeth can help to prevent future dental problems? The reason is that crooked teeth can be tough to keep clean resulting in cavity-causing bacteria and even tooth loss. You also can get relief from issues such as headaches, TMJ, eating difficulties and more when you straighten your teeth with Invisalign. Not only can these clear aligners give you a straight, stunning smile, but they could help you maintain peak oral health. 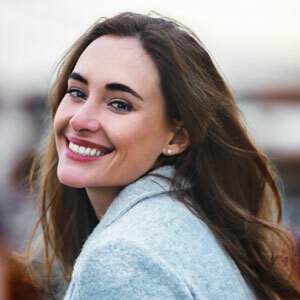 If you’d like to experience the confidence-boosting effects of a straighter smile, contact us today to book a consultation with Dr Philip Chou (Dentist)!